A murderous traitor to the Teen Titans in a previous incarnation, a new Terra rocks the DCU in November. Terra made her first appearance in NEW TEEN TITANS #26, when Changeling - today known as beast Boy - foiled her attempt at a robbery. Subsequent issues would see the team tracking the girl down and learning she was being forced to commit crimes by terrorists who had kidnapped her family. When the Titans helped her defeat the terrorists, they revealed that her family was dead. Distraught, Terra found comfort by joining the Titans. Over the next year, Terra gained the love and support of the Titans and their faithful fan base. House ads in other DC comics prominently featured a smiling Terra and proclaimed her "The latest sensational member of the New Teen Titans!" How did the entire concept of the Teen Titans came about? Was it DC's intention for it to complete with the X-Men or was it a surprise hit? Had you and George Perez always had the idea of Cyborg, Raven and Starfire, back in Marvel? Why did DC not include firestorm within the Teen Titians. Who had come up with the concept of Nightwing. You’re not asking for much, are you? Seriously, I get this asked a lot and I may have even answered a version of this before here, but since folk don’t generally go through the back date archives, here we go again: Titans came up because I had decided to leave Marvel and move over to DC. Back then you could only work for one company, not both. Len (see above) was an editor at DC at the time and though I was given a number of assignments when I got there, I really wanted to do my own thing. Len and I had written a Titans story way back in the first series (the Russian Starfire (later Red Star) story and I always had a love for the Titans concept. 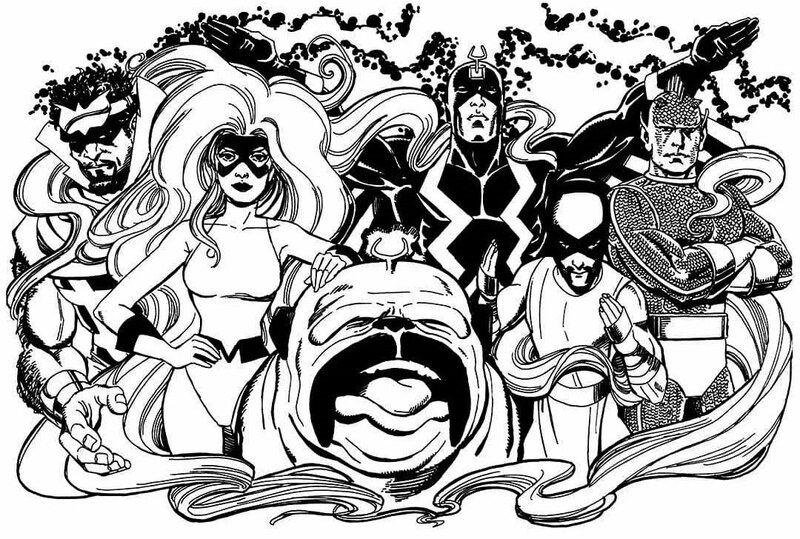 I came up with a bunch of characters – more on this in a moment – then Len and I pitched it to the Powers That Be. Unfortunately, they didn’t want a new Titans series because they didn’t like the previous one. They had no thoughts about doing a DC version of X-Men, no matter what people think. Nor did I, by the way. Despite Len – who created the New X-Men being my editor – I was never much of an X-Men fan and doing a DC version of that book never crossed my mind. I wanted to do a ‘family’ book. Frankly, in my mind I wanted to do a DC version of the Fantastic Four, which, as Stan Lee himself has always admitted, was a Marvel version of the J.L.A. Anyway, the Powers That be asked us why they should publish a new Titans book when the last series didn’t do well, and we replied, with no false modesty, “Because we’ll do it better.” I guess they agreed because they not only greenlit the book but an introductory story that appeared in DC Presents #26. At this point I ran into George Perez up at Marvel and offered him the book. He said yes thinking it would be dead 6 issues later. 16 years later I got off the title and it’s still running today, with most of the characters intact, albeit in a somewhat different form. As for how the individual characters were created, that’s harder to say. I gave the group a lot of thought. I knew I’d want to use original Titans members Robin, Wonder Girl and Beast Boy (with a new name) in the new group. Kid Flash would probably appear but I wasn’t all that enthusiastic about him. My feeling has always been that writers have to pull back on that character because if you use him properly in a group book he’ll not only get to wherever they’re going faster than the other can, but he will probably have already solved the problem. In short, he’s too powerful for a group dynamic. I also didn’t want to make Aqualad a regular member because if you use him you are forced to use water stories to fit him in. I prepared a list of new characters. I wanted an alien, and that became Starfire. I wanted an athlete and that was Cyborg and finally I wanted an empath which became Raven. Obviously, it wasn’t as simple as that, but the work to create those characters, and to come up with a back-story I could keep mining whenever I wanted to, would take much too long to explain. Suffice it to say I spent a lot of time working out the characters so they would blend together both emotionally and power-wise before I gave the character descriptions to George to design. One he did I refined what I wrote and, as they say, the rest is history. 1.) I'd like to see a series of columns describing how you came up with the new characters you introduced in NEW TEEN TITANS. Starfire, Raven, Cyborg, and the ones who came later like Deathstroke, Terra, Kole, and so on. What prompted the idea for each character, what was involved in fleshing them out as characters, and what kind of response you initially got from DC about them all. Did the finished, published product closely match what you'd originally intended? If not, how much different did the end result come out to be? I know you said you didn't want to spend a lot of time on "behind the curtain" stuff, but I am always curious about how much of a writer's ideas make it to the printed page, and when something is rejected or altered, why the editor felt that was necessary. 2.) In a similar vein, I remember that some years ago, you and George Perez were supposed to do a TITANS graphic novel that never did show up. Since the odds of it ever being finished and published are about the same as my chances of becoming Miss Universe, I wonder if you might clue us in on what the plot would have been? Okay, continuing from the above – I came up with Deathstroke pretty much right after I came up with the Titans. I knew Deathstroke would be in issue #2 but his son would appear in issue #1. The genesis of Deathstroke came very fast. I wanted a very moral character who was also a criminal, a sort of Batman for the mercenary world, complete with his own Alfred. Unlike Alfred, however, I wanted his partner to be his mentor. That’s where Wintergreen came from. His name, of course, came from the gum, just as Princess Koriand’r’s name came from the spice, coriander. She was the spicy Titan, after all. I wanted Slade Wilson to be the kind of character that you never could fully understand. You would also never know which side he would be on because he operated by his own very strict code of conduct. Slade would be troubled by what he had to do, but he was also caught up in a web of his own creation and was unable to break free. Simply, I wanted to create an antagonist who would be as well defined as the Titans themselves. Only mistake I think I made with him is having him have a physical relationship with the 16 year old Tara Markov. That was wrong. Which leads to Terra. That was easy. George and I wanted a Titan who betrayed the others. We also wanted to play against every reader conception of who characters are. George and I knew her whole story before we began and we knew she would die. We set the story up with her trying to destroy the Statue of Liberty to show she was the bad girl, but we knew if George drew her as a cute kid everyone would simply assume she would be ‘turned’ from the dark side because that’s the way it was always done which is why that wouldn’t be the way we did it. Tara was insane and stayed that way right until the moment she died. By the way, she IS dead. I don’t know what other writers will do with her – if anything – but if they want to honor the original series they will leave her dead. The Terra from Team Titans was – as stated – some kid the villain kidnapped and physically and mentally altered her into looking and acting like the original. But she was NEVER the real Terra. One last note: I came into DC with Terra the same day Mike Barr came into DC with Geo-Force. Both had earth-shifting powers. It would have been unfair for one of us to get rid of our character, so we decided to make them brother and sister. Finally, Kole. Because other editors were not pleased that they were asked to come up with characters to kill in the Crisis, I realized I’d have to come up with somebody to knock off as well, if only to assuage their feelings somewhat. I came up with the crystal powered Kole who was named after and drawn to look like a real person we knew. The problem was, Jose Luis Garcia Lopez, who drew the Kole issues did a magnificent job and I grew to really like the character and wished I hadn’t created her to die. But if I were to play the game nicely, she had to weave her last crystal. As for “Games,” the graphic novel George and I began way back when. George drew about 80 pages of the best Titans work he ever did before going into artist’s block on the Titans. I kept trying to convince DC to let another artist finish the last 30 pages, but for reasons that have never made sense to me they have always refused to do so. Every so often I bring it up again and the answer is still no. Why? I can’t imagine. There are 80 pages done. I’d have to dialogue the job and much of it would need to be inked, but I think even if it now had to be an Elseworlds book – or at least a Hypertime story – that people would flock to buy a hardcover Perez/Wolfman Titans book. What do you think?